- Wind Only! Equipment of 11 stars Lv100 limit in the winning line-up of "Authentic-Astra Arms Festival" are available by element for 1 day only! 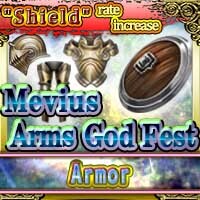 - Campaign to increase offering rate of "Shields" from popular "Mevius Arms God Fest [Armor]"! - Helps you up to change to advanced class! "Class Change Support Set" is filled with usable items to change class is now available! - Get your Arm Lv up to 100 with ease! "[Once per day] Enhance Stone 100 Set" on sale! 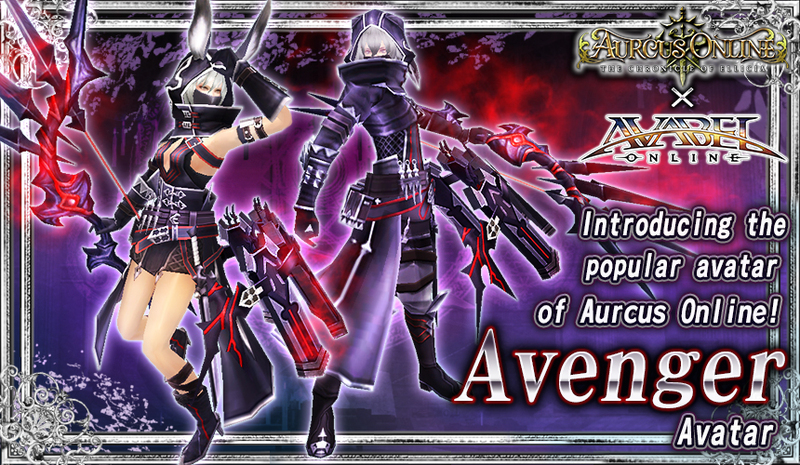 - "Avenger Avatar " now available!Wind Only! Equipment of 11 stars Lv100 limit in the winning line-up of "Authentic-Astra Arms Festival" are available by element for 1 day only! Introducing the 1 day limited pack that gathers all the "Wind" only Astra Arms together! Additionally, we are starting the campaign "Stone Big Box 10" for when you use "Spin x 10"! 60 Gems per "Spin x10"
Campaign to increase offering rate of "Shields" from popular "Mevius Arms God Fest [Armor]"! 11 stars and above are confirmed to win, and as armor level-limits are higher, the stronger the armor! Go beyond Max Boost, and go for more power! *The won Armors have equip level limits. *The offering rate for "Shields" will increase compared to original "Mevius Arms God Fest [Armor]." With this increase rate, other parts from this line-up will decrease its offering rate. Helps you up to change to advanced class! "Class Change Support Set" is filled with usable items to change class is now available! The set with massive Sharp Crystals, Hard Crystals, and Orbs necessary for changing to Advanced Class is born with a BIG BANG! Plus! It comes with ''Restatus Scroll'' which comes in handy after changing your Class! It's limited to 1 purchase! Don't waste any time! * Can be purchased 1 time for each account. Get your Arm Lv up to 100 with ease! "[Once per day] Enhance Stone 100 Set" on sale!Enhance Stones that come in handy when enhancing your Arms will be sold in sets! This time, we have prepared "Enhance Stone 100 Set" that can be used to enhance up to Lv 100! *This is a set item with enhance stones that can earn enhance experience points necessary to raise Arms level to 100. *Necessary experience points are different for Arms which have been Awaken. Please refer to Help Book for details. "Avenger Avatar " now available!